Nightshades: Fall produce includes the final harvests from such fruiting summer crops as tomatoes, most peppers, eggplant, and okra. These crops belong to a family called “nightshades;” they are typically heat-lovers, so you can expect their harvest to peak once more as we briefly pass through their preferred temperature range, but then their productivity will taper off again as the temperature lowers. Leafy Greens: Additionally, local growers will begin introduce large, more heat-tolerant greens, such as collards greens and swiss chard. As we approach cooler weather, greens will go into full swing! Look forward to the return of kale, spinach, lettuces and various mixed salad greens. Grown in succession, these cool-weather crops will remain available locally until warmer weather returns. Nut Trees: Nut season also goes into full swing during the fall, offering the freshest harvests of the year, for filberts (hazelnuts), pecans, and walnuts (as well as a second harvest of almonds in most areas). Fruit Trees: Fruit trees vary significantly by variety; many peaches, pears, plums and apples will remain in season during at least the beginning of fall. However, heat-loving trees such as mango and avocado (as well as many varieties of the aforementioned fruits) will taper off very quickly as the temperature drops. pomegranates and dates also become plentiful in fall and are available throughout the duration of cooler temperatures. Given the great range of climate zones in Arizona, our seasons tend to offer a greater diversity of options than many other places across the country, which is great news for Zonies! Buying local and in season tends to support the most sustainable farming techniques and farm-to-market relationships. By choosing locally grown veggies & fruits that are in season, you ensure that your family's food does not have to travel the several thousand mile journey that most conventionally-farmed produce takes, in order to reach your dinner table. Locally grown produce operates in the same climate zone you do, so if you’re willing to follow Mother Nature’s menu for the season, your family can significantly decrease its consumption of fossil fuels—aka dead dinosaurs. Preparation: Pre-heat oven to 350 degrees. 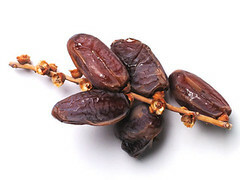 Slice open each date and fold open removing the pit. Break apart a dime size piece of goat cheese and place in the center of the date and fold close. Take a piece of bacon and wrap around the date and secure with a toothpick. Repeat with the remaining dates and place on a cookie sheet pan. Place in oven for 10-15 minutes until bacon is crispy. Remove toothpick and arrange on platter. Variation: If goat cheese isn’t your thing, you can substitute Maytag Bleu cheese, Sartori Gold Asiago, or plain cream cheese. Note: Pairs well with a dry sparkling wine. Swiss Chard Preparation: Place olive oil and shallots in a large sauté pan. Cook until translucent. Add Swiss chard, apples and dried cranberries. Cook until Swiss chard is wilted. Season with basil, salt and pepper. Serve in bowl and garnish with spicy pecans. For an added touch add goat cheese or feta cheese. Procedure Boil a large pot of salted water. Add the rice and decrease the heat to maintain a simmer. Cook rice until it is tender (about 30 minutes). Preheat the oven to 375 degrees. Peel and seed squash and cut into 1 inch cubes. Toss squash in large bowl with Paprika, salt and 1 tbsp of olive oil. Spread evenly on a baking sheet and roast, stirring occasionally until browned and tender (about 40 minutes). Let cool. Spread pecans on another baking sheet and bake until fragrant, about 6 to 8 minutes. Whisk together remaining olive oil, lime juice, maple syrup and pepper in a serving bowl. Toss with the reserved rice, roasted squash, green onions and most of the pecans, pomegranate seeds and feta. Sprinkle with the rest of the pecans, pomegranate seeds and feta. Enjoy! Preparation: Boil eggplant in salted water till done. 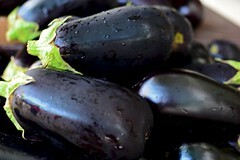 Drain well and squeeze water from eggplant until it's almost dry. Mash the eggplant with a potato masher or fork. Cut thighs into strips and fry in olive oil over medium heat until half done (If cooking Vegetarian/Vegan, recommend decreasing to 1 tblsp and omit chicken altogether), add onions and continue to cook till limp, add garlic and black pepper and cook for an additional minute. Add the drained eggplant, and saltines and combine. Adjust seasoning. Put into a buttered casserole dish, top with tomatoes and cover with cheese. Cover with foil and cook in a 325 degree oven for 1/2 hour until bubbling and cheese is lightly browned, removing the foil for the last 10 minutes. Note from the chef: My mother used to feed this to us when we were kids as a side dish without the chicken. I added chicken to it to make it a main course casserole. Ingredients: 2 1/2 cups flour 2 extra large eggs 1/4 cup white sugar 2 teaspoons baking powder 1 teaspoon baking soda 1/2 teaspoon salt 1 teaspoon cinnamon 1/4 teaspoon nutmeg 3/4 cup packed brown sugar 1 1/2 cups prepared pumpkin puree* (Instructions follow recipe) 3/4 cup buttermilk 6 tablespoons butter, melted 2 teaspoons vanilla extract 1/4 cup raw sugar 1 cup each: dried cranberries 1 cup coarsely chopped pecans optional: 1 cup White Chocolate Chips—but, why not? Procedure: Preheat oven to 400 degrees. Line a muffin tin with cupcake or muffin papers. In a Medium bowl, whisk together flour, white sugar, baking powder, baking soda, salt, cinnamon and nutmeg. Set aside. Whisk the eggs lightly in a large bowl. Add the brown sugar and whisk continuously until pale brown - about 2 minutes. Whisk in pumpkin, melted butter and vanilla and continue mixing until smooth. Stir in flour mixture, using a spatula until just moist. Add dried cranberries, chopped pecans and white chocolate (if used) and stir until evenly distributed. Do not over mix. Fill muffin cups 2/3-3/4full. Sprinkle with raw sugar to create a crusty top. Bake for 18-22 minutes until light golden brown on top and a toothpick inserted comes out clean. Procedure for Pumpkin Puree: Preheat oven to 350 degrees. Cut the tops off of 1-2 small to medium size pumpkins (like you are about to create a Jack-o-lantern). Then, cut the "body" of the pumpkin into quarters (slicing top to bottom). Scoop out seeds (save to roast later) and set aside. Then, cut each quarter slice in half (in the width). Place on a foil lined baking sheet and bake the pumpkin chunks for approximately 45 minutes or until the pumpkin flesh is fork tender (the pumpkin flesh will brown in spots and that's ok). Remove from oven. Allow to cool until cool enough to touch. Peel the skin from the pumpkin using a knife. The skin should come off easily if pumpkin is done. Place a few pumpkin chunks into the bowl of a food processor and process until fully pureed, adding a few chunks of pumpkin at a time until all of the pumpkin is pureed. If the pumpkin puree seems a bit watery, pour into a very fine sieve to allow the excess water to drain out. You can pour any excess puree into ziploc bags. Remove as much air as possible and store in the freezer for later use. That's it for the Fall 2013 Seasonal Fare Competition. Stay tuned for next season as we explore cool weather crops!